I create so many cards with a white background, and as a result I don't often use white embossing powder. Embossing in white creates a really fresh look and adds texture and depth. 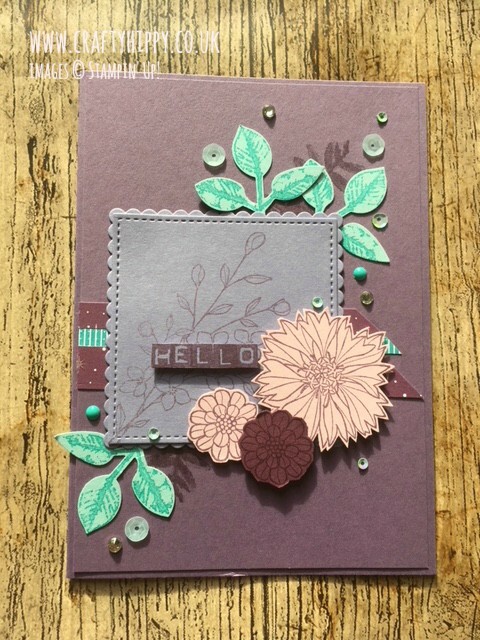 This card is a variation of the Perfect Plum Touches of Texture Card I made back in February (picture below). The Touches of Texture stamp set is perfect for floral projects and this card is perfect for using up your scraps. I love the contrast of the white embossing on the coloured card. The white embossing on the white cardstock also creates a layer of extra depth. I really went to town with the embellishments; I used a mixture of Brights Enamel Shapes, Iridescent Sequins and some white sequins from the Metallics Sequin Assortment. I fussy-cut the flowers using our Paper Snips, and layered everything with some Stampin' Dimensionals. You can find the full list of Stampin' Supplies used for this project at the bottom of this post.